SINSINAWA, Wis.—The Sinsinawa Dominican Congregation recently approved a corporate stance in recognition of climate change and is committed to improving our relationship with Earth. This corporate stance was written by the Dominican Sisters in Committed Collaboration (OPSCC). Therefore, the stance is introduced by saying, “We, the Dominican Sisters in Committed Collaboration, in partnership with the Dominican Sisters of Sinsinawa.” Sinsinawa Dominicans believed that signing onto an already-strong stance with OPSCC will strengthen their own commitment and witness to the kind of interdependence and collaboration that is necessary if we are to respond well to climate change. As part of their partnership, the OPSCC and Sinsinawa have agreed to work collaboratively on educational programs around climate change for Dominican congregations. The stance states the Sinsinawa Dominican Sisters believe that our present relationship with Earth and the resources provided by Earth are grievously imbalanced and harmful to the planet itself. The impact of human action stresses and overwhelms the self-sustaining and self-correcting capacities of our environment, narrows bio-diversity, and threatens the capacity of Earth to support future generations. The Congregation realizes the reality of global climate change negatively impacts the community of life in ways beyond human understanding and that the negative impact on the human community is experienced more forcefully by those living in poverty and those living in fragile ecosystems. The Sinsinawa Dominicans are committed to joining others in creating awareness and action toward a more sustainable future by working for systemic change and promoting legislation to protect the environment and the community of life. Sisters have already invested in supporting the development of sustainable energies and advocated for more environmentally responsible corporate policies and practices. 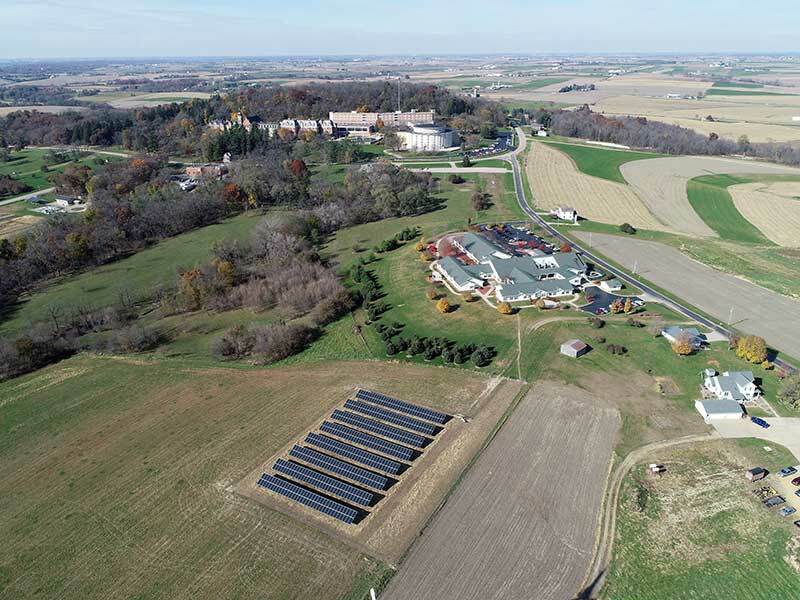 For example, the sisters recently installed three solar arrays at Sinsinawa Mound which will save the organization over $35,000 annually in utility costs. By 2022, the Congregation hopes to restore most of the savanna ecosystem, convert 15 acres of manicured lawn to prairie, and restore and protect over 50 acres of forest, all at Sinsinawa where the Sisters also continue to expand their organic farm operation known as Sinsinawa Mound Collaborative Farm. Sinsinawa Dominican Sisters invite you to learn more about their work by visiting their website at www.sinsinawa.org. The Sinsinawa Dominicans are part of a worldwide Dominican family, the Order of Preachers. For over 800 years, Dominicans have continued to preach the Gospel in word and deed. Today, thousands of sisters, nuns, priests, brothers, associates, and laity minister in more than 100 countries around the world.